This year I will revisit an old favorite homestead of mine on the North Island in a little community called Te Kaha on the Bay of Plenty. The owners, Tracy and Paul O'Brien are old friends and like family at this point since we've known each other for such a long time. 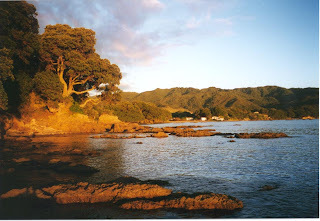 Te Kaha is primarily inhabited by Maori people who are the indigenous people to New Zealand. Of Polynesian decent, they comprise about 10% of New Zealand's population which is now around 4 million total for both islands. The trip will start from Butte, Montana on November 14th at which time I'll fly to Los Angeles to connect with my Air New Zealand flight to Auckland, New Zealand which will take roughly 12 hours and 45 minutes. On arrival in Auckland I will clear customs and then transfer over to the domestic airport for my domestic flight to Tauranga which will only take 35 minutes. From Tauranga I will be met by someone from the O'Brien family and we'll head off to Te Kaha, about a three hour drive. The next time you hear from me, I'll be in New Zealand.